Click on the Play Button and '13 More Days in Hell' will start after this message... Thanks for waiting! Do you want to survive? Try to reach the rooftop of this hotel before running out of time - kill dozens of zombies and find useful items on your way. Are you ready? 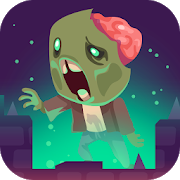 Shoot and try to kill waves of brain-eating zombies in each stage. Reach the most difficult corners by making the bullets ricochet on the steel bars! Try to survive in a world full of mutant creatures! Survive for thirteen days! Zombies won't stop attacking you aim and defeat them as fast as you can.